I felt the sweat begin to form on my palms as I adjusted my grip on the white painted rail, cracked and worn down to the metal with time. My grip adjusted, I leaned out further. A thought flashed across my mind: I haven’t felt this free in a long time… or this scared. I embraced the fear, leaning out just a few inches more; and then a few more. The wind whipped my face; my long hair blinded me, as it blew every which way. I was on the train from Kandy to Ella, considered on of the most scenic train rides in Asia. This ordinary passenger train winds its way through some of Sri Lanka’s most beautiful landscapes. From the ancient Kingdom of Kandy through to Ella, best known as the home of Sri Lanka’s tea plantations. If you are departing Kandy you’ll be rewarded with the best views of the right-hand side of the train and it won’t be long until you get a glimpse of what make this train ride in Sri Lanka so famous. Tiered fields of Camellia Sinesis – better known as the tea plant – cover the hills that the train tracks pass. At some points so close that an overgrown Camellia Sinesis tree leaves would brush against my legs dangling out of the train door (I do urge caution if you choose to do this). A face poked out the window from the next carriage and watched me curiously. I wonder in my mind if this local man thought I was some crazy tourist with a death wish, or – as he turned his head towards me then back down the track – I wondered if he simply wanted to know why I was grinning stupidly even as I was blinded by sun, my hair, and the dirt. I jumped, startled. a building and people passed by at lightning speed. I’d been so focused on my grip, the fear of falling, the boys face appearing that I didn’t realise that we were approaching a station. That’s what the horn blows are for: a warning. 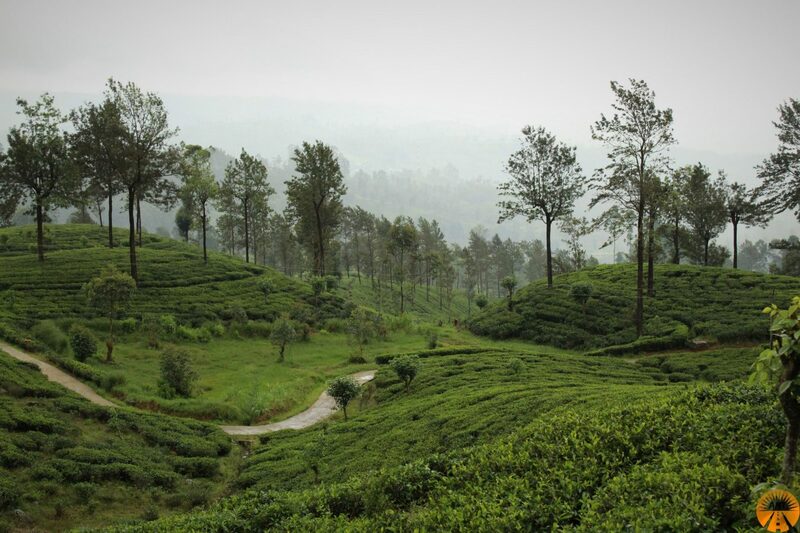 Click here to find out how to visit a Sri Lankan tea plantation! White stupas pass by; Hindu temples. Small statues of deities placed haphazardly along the wall at indistinguishable intervals. Prayer flags lazily moved in the humid day, too hot to move. People walked the tracks. Tuk Tuks race down dirt paths. Even a monitor lizard, the size of a small dog, raced across the tracks into a field to the coolness and away from the noise that the train brings. As the journey continued the view only got more pretty. Sitting in the comfortable leather-clad seats of Second Class in the train with the windows opened on every side- to take photos and for the free air conditioning that rid the carriage of the ebbing heat as the sun grew higher – there were times when I jumped. A train whizzing by; the people just blurs. Like that, they were just memories. The train from Kandy to Ella is stunning. Even better than the train from Colombo to Kandy, that I had taken just days ago, I’d say. As the train bumped and lurched its way through Sri Lanka’s hill country my friends and I stood at the very edge of the carriage staring out. Our knuckles white from gripping the rail, praying that the next bump won’t send us over, but – my gosh – for the experience, the feeling of utter freedom as the sun danced upon our face as we shrieked and giggled at each jostle, it was worth the risk for the memories. The first thing to consider when planning to ride the Kandy to Ella train is what class you want to travel. If you want a guaranteed seat for the 4+-hour journey (or double that if you board in Colombo and plan to ride the whole way), then you’ll need to book a first class ticket in advance. Seats do tend to sell out – it’s considered the most scenic train in Asia with good reason! – so book in advance. Also, if you don’t pay for a 1st Class Ticket or 2nd Class Reserved Seat ticket, you may find yourself standing for the whole journey on a very cramped train. Book online through a ticket agent. There are many but I used 12go.asia when booking my ticket on the Kandy to Ella train. The only downside of them: you must book at least 32 days in advance due to high demand. Reserve your ticket at the station. Try to visit the station at least the day prior to when you want to travel. Prices for these advanced tickets seemed to be a little more expensive than same-day tickets (which I have also purchased) but you will be able to buy 1st and 2nd class tickets which guarantee you a seat. Buy tickets on the day of travel. You will most likely be able to purchase 2nd or 3rd class tickets on the day you want to travel. While these are the cheapest, I would highly recommend spending a few dollars more to get a 1st or 2nd class ticket purely to guarantee a seat – four-hours without a seat feels like an eternity – trust me! If you are on a tight travel schedule I highly recommend avoiding this. It’s important to note that the train from Kandy to Ella is a regularly scheduled service and is incredibly popular with locals. You’ll find the 2nd and 3rd class carriages to be particularly full around large stations (think Colombo, Kandy, Nuwara Eliya and Ella) and also during high season. What are the seats like on the Kandy to Ella train? There are a few different options when deciding which seat you want onboard the train from Kandy to Ella. 1st class seat: if you are looking for the most comfortable way to experience the 4-hour journey between Kandy and Ella then this is the ticket you should choose. You’ll be given a numbered comfortable seat within an airconditioned carriage. If you prefer a little privacy then this is the ticket you should buy. As the windows don’t open you’ll be photographing through the window or crowding in the area between carriages. 2nd class seat: if you want to take photographs of the view then you want to book a 2nd class seat. There are two different types of 2nd class seat. For the very affordable 2nd class non-reserved seat you’ll be entitled to a comfortable seat onboard the train. If you purhcase a 2nd class reserved seat you’ll have the same seat but in the numbered section which is perfect if you are travelling with families, friends or in peak season! 3rd class seat: If you want to experience Sri Lanka like a local then this is the ticket you need. A 3rd class seat is super cheap (it costs less than 130 Sri Lankan Rupee – that’s about AU$1.02 or US$0.72 – to travel from Kandy to Ella by train!) but the wooden benches are not the most comfortable way to experience such a long train rides (and trust me, they’re long!) I’d save these fares for shorter journeys, like between Nuwara Eliya and Ella, or Colombo and Negombo. If you are travelling outside of peak season, I would choose to book a 2nd class non-reserved seat. During peak season, I would book a 2nd class reserved seat or a 1st class seat. Would you ride the train from Kandy to Ella? Are you a pack-horse or a packing pro?